My mother is French, my father a Samoan King. I was raised as a Prince on the Island of Upolu. I told you I'm a professional gambler who has been banned from dozens of casinos and must remain anonymous. Whoever asked this is too stupid to play blackjack. Try tiddlywinks. My favorite film is "The Man Who Would Be King". Sean Connery plays Daniel Dravot, Michael Caine, Peachy Carnehan. God's holy trousers! You should have known that. You seem to favor 888casino. Why? They have the seal of Good Housekeeping, eCOGRA. They use Microgaming software. You can place a wager without a download. They offer some of the best bonus promotions out there. No. 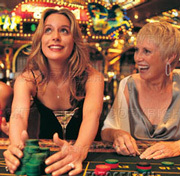 The casinos want to keep you drunk and dumb. I love guys who lose a thousand dollars and think it's okay because they had 4 "free" drinks. The casinos love them too. Progressions do not work. Period. I will not respond to any questions regarding them. If you insist, submit them to the Nobel Committee and you will receive the Prize for Mathematics. That said progressions and systems can have entertainment value. Some slow your betting down and you lose less because you bet less. How do I tell if my casino makes it good for the gambler or if they are a rip joint? Some casinos are exciting places. They know they have the edge and they let gamblers gamble. Others are run by bean counters and they have one mission and that is to get your money. A key signal that you are in a rip joint is the double deck game. If they do not allow double after splitting ( DAS ) you are in greed city. DAS creates variance. It is fun and exciting for the player. Bean counters want your money in a quick steady flow. I guarantee you their other games are bad and their slot machines are very very tight. They may have smiling employees and a fancy players card club, but it is designed to cover up the greed. Leave quickly. Better yet, use their restroom. Splurge on hot water, soap and paper towels. THEN LEAVE! Can I see more pictures of your mom?